Jammin’ For Jesus is set for Sunday, June 5th at 2:00 pm in the Branson Star Theatre Complex. Joining host Jimmy Jack Whitaker are CGMA award winning artists Bob & Alta Courtney. Others “jammin'” are recording artist, theatre, & TV performer Barbara Fairchild, duo Heart to Heart’s Jerry & Sharon Mays, and singer, song-writer Anita French Kidd Stahl. One may also enjoy the talents of vocalist Kathy Hurst, Gary Griffin, Joie Christensen, The Heaven Bound Travellers from Kansas City, 4 Calvary Quartet, and Branson’s saxophonist Gary Dooms. A love offering will be taken as well. 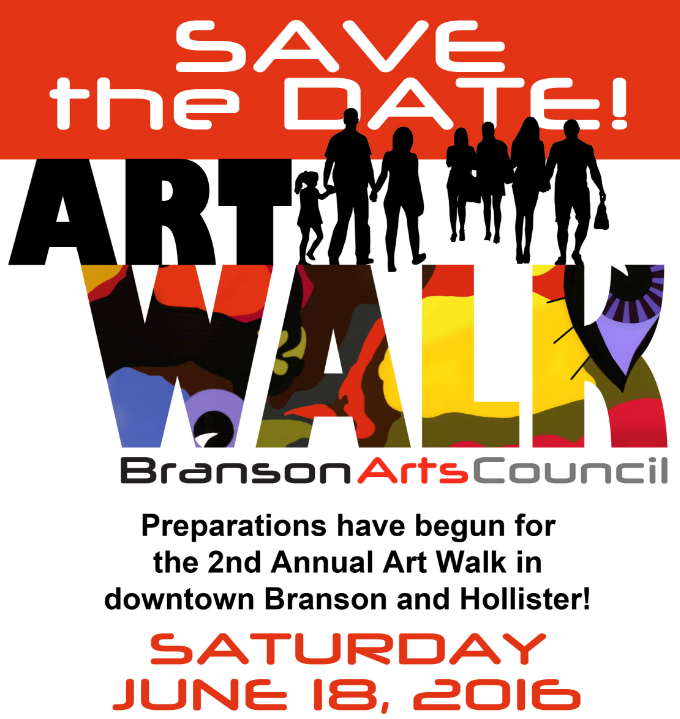 The Branson Arts Council is facilitating the 2nd Annual Art Walk in downtown areas of Branson & Hollister, MO. Saturday, June 18th from 5:00 pm to 9:00 pm. 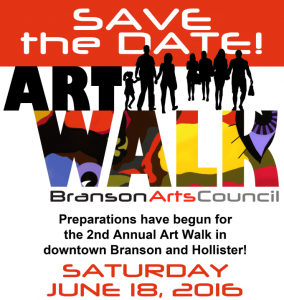 The Art Walk is a showcase for the many flavors of artistic culture in the Branson Community. The family-friendly event is FREE & OPEN TO THE PUBLIC. It is a collaborative effort between Branson Arts Council (BAC), local business, and the many artisans who live and work in the Ozarks. Art Walk is a self-guided tour of in-store & sidewalk exhibits designed to highlight local artists and the businesses hosting them. First ever Scott’s Firefighter Combat Challenge in Branson! In honor of the Fire Service and Firefighter Appreciation Month, the first ever Scott Firefighter Combat Challenge in Branson will be held May 6 – 7 at Branson Landing. As seen on ESPN for a dozen years, the Challenge annually attracts hundreds of U.S. and Canadian municipal fire departments at more than 25 locations and is now expanding to countries around the world, including New Zealand, Germany, Argentina, Chile, and South Africa. The Challenge seeks to encourage firefighter fitness and demonstrate the profession’s rigors to the public. Wearing “full bunker gear” and the Scott 5.5 Air-Pak breathing apparatus, pairs of competitors race head-to-head as they simulate the physical demands of real-life firefighting by performing a linked series of five tasks including climbing the 5-story tower, hoisting, chopping, dragging hoses and rescuing a life-sized, 175 lb. “victim” as they race against themselves, their opponent, and the clock. The Branson Firefighters Association, IAFF Local 152, Branson Landing, and Branson Convention and Visitors Bureau are partnering to bring the Scott Firefighter Challenge to Branson, MO for the FIRST TIME in 2016, sponsored in part by Come Alive Crossfit. The Challenge seeks to encourage firefighter fitness and demonstrate the profession’s rigors to the public. Wearing “full bunker gear” pairs of competitors race head-to-head as they simulate the physical demands of real-life firefighting by performing a linked series of five tasks. There are many events/activities centered around this event to benefit the Branson Firefighters Association and Local 152 International Firefighters. The action-packed fun-filled weekend includes, in addition to the Challenge, a Safety Vendor Fair located next to the Combat Challenge Course on May 6 & 7 from 10 am – 6 pm, the Ozark Mountain Fire Truck Parade on May 7 at 10 am down the Branson Landing Boardwalk, and a live concert by “Resurrection — A Journey Tribute” on May 7 at 8 pm!